Eligibility: Entrants must be 18 years or older as of December 5, 2018. Employees of The ESP Guitar Company and their affiliates, their agencies and representatives and their immediate family members, and individuals residing in the same household as such individuals are not eligible to participate in this sweepstakes. This sweepstakes is void where prohibited by law and is subject to all applicable federal, state, and local laws and regulations. By participating, entrants agree to these official rules, the decision of the judges and voters and agree to accept all decisions of ESP with respect to this sweepstakes as final. Sweepstakes Period: The sweepstakes will begin on December 5, 2018 at 5PM PDT and entries will be accepted until 11:59 PM, PDT, on December 31, 2018. Prizes and Odds of Winning: One Grand Prize will be awarded to one randomly-selected winner. The Grand Prize is an LTD M-400M guitar in Natural Satin finish. The odds of winning will depend upon the total number of eligible entrants. ALL PRIZES ARE AWARDED ON AN “AS IS” BASIS WITHOUT WARRANTY OF ANY KIND, EXPRESS OR IMPLIED, INCLUDING, WITHOUT LIMITATION, ANY WARRANTY OF FITNESS FOR A PARTICULAR PURPOSE OR WARRANTY OF MERCHANTABILITY. 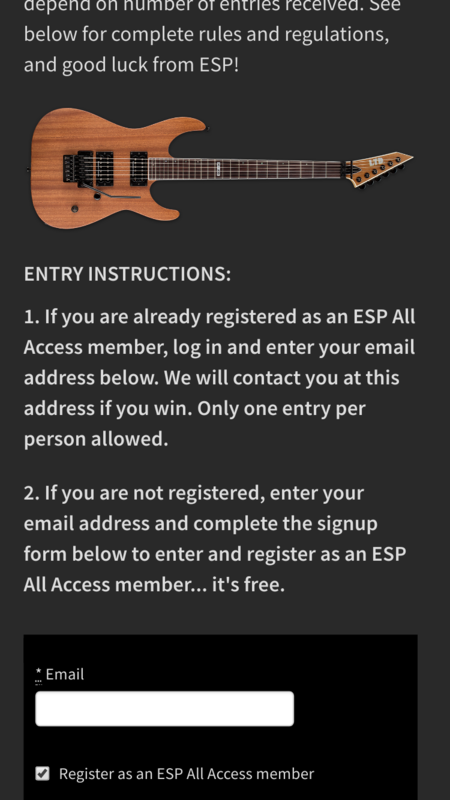 Winners List: Winner information will be posted at www.espguitars.com on or before January 7, 2019.